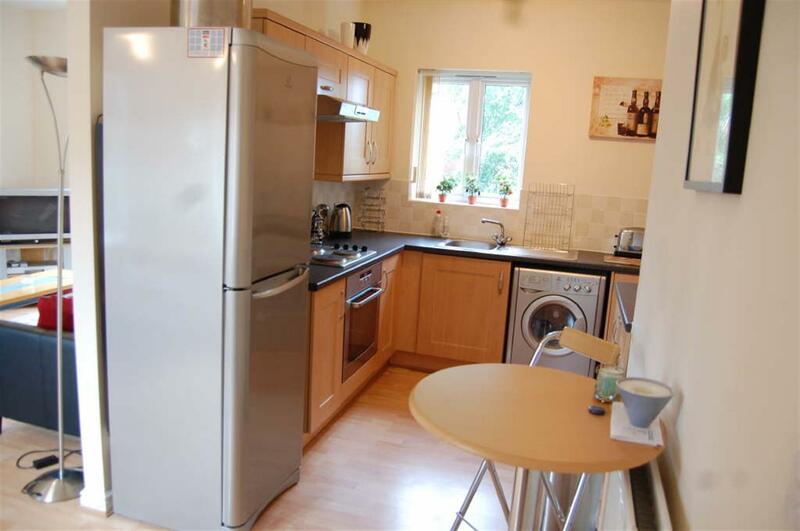 This modern fully furnished first floor apartment is presented throughout to a good standard and enjoys sizeable accommodation comprising of entrance lobby, large fitted kitchen/breakfast room and large lounge/diner, two bedrooms and luxury bathroom, plus the added benefit of two storage cupboards. Externally the property enjoys a parking space and landscaped grounds. Internal inspection of this property is considered essential. With double glazed side access door, double panelled radiator, stairs to first floor landing. With Upvc double glazed window to rear, four lamp spotlight fitting, range of base and wall mounted beechwood storage cupboards providing ample cupboard and drawer space with granite effect work surface, built-in stainless steel sink unit with mixer tap above, ceramic splashback tiling, wood effect laminate flooring, Indesit washing machine and hot and cold plumbing, built-in brushed stainless steel Whirlpool electric hob unit with extractor hood above and oven beneath, Indesit fridge and freezer, double panelled radiator, Myson electronic time clock and programmer, built-in boiler cupboard with Potterton Promax HE boiler providing the domestic hot water and central heating systems, spurs for appliances, seven power points, Myson thermostat, BT telephone point subject to usual transfer regulations, Upvc double glazed window. With single panelled radiator, power point, three lamp light fitting, access to loft space, double doors reveal built-in cloaks providing ample hanging space and storage space, electricity consumer unit, pendant light fitting, wood effect laminate flooring, built-in airing cupboard with copper hot water cylinder, ample drying space and storage space. With Upvc double glazed window to front, pendant light fitting, double panelled radiator, wood effect laminate flooring, four power points. With Upvc double glazed window to front, pendant light fitting, double panelled radiator, wood effect laminate flooring, three power points. With Upvc double glazed window to rear, Manrose extractor fan, globe light fitting, electric shaver socket, white suite comprising low level WC, pedestal sink unit and panelled bath unit with Hydramax directflow shower, ceramic splashback tiling with inset decorative border tile, wood effect laminate flooring, single panelled radiator. 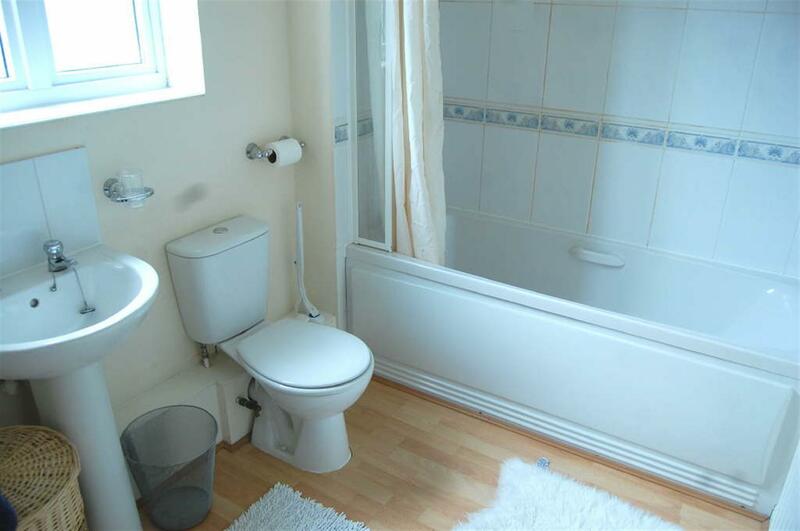 The property is offered to let for a minimum term of six months at £595.00 per calendar month exclusive of council tax, water rate and all other normal outgoings. A deposit of £695.00 will be taken against damage/breakages etc. The tenant will be expected to pay a non returnable fee of £105 including vat, on application, to cover the costs of referencing, preparation of lease etc and there will be an additional £50.00 including VAT if a guarantor is required.Before you are granted a tenancy, you will have to demonstrate your eligibility under the Right to Rent 2014 to establish your immigration status, there is a cost of £19.20 payment payable direct to Ifaqs Ltd for this check. Sorry no pets. Sorry no smokers. Strictly by appointment with the Agents at 2 Watlands View, Porthill, Newcastle, Staffs ST5 8AA. Telephone: 01782 717341. From Hartshill village centre take Hartshill Road toward Stoke, turn right to Princes Road (NSRI hospital complex), turn second left to Quarry Road, first right to West Avenue, turn right onto the flat complex and turn left in the car park and number 11 will be found in the front block on the left hand side.